The reasons behind American opposition to the Vietnam War fell into several main categories: opposition to the draft; moral, legal, and pragmatic arguments against U.S. intervention; and reaction to the media portrayal of the devastation in Southeast Asia. The draft, as a system of conscription which threatened lower class registrants and middle class registrants alike, drove much of the protest after 1965. Conscientious objectors did play an active role although their numbers were small. The prevailing sentiment that the draft was unfairly administered inflamed blue-collar American and African-American opposition to the military draft itself. Opposition to the war arose during a time of unprecedented student activism which followed the free speech movement and the civil rights movement. The military draft mobilized the baby boomers who were most at risk, but grew to include a varied cross-section of Americans. The growing opposition to the Vietnam War was partly attributed to greater access to uncensored information presented by the extensive television coverage on the ground in Vietnam. 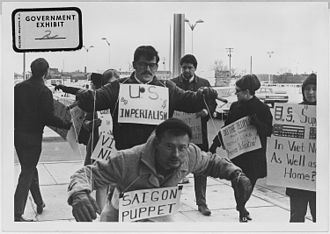 Beyond opposition to the draft, anti-war protesters also made moral arguments against the United States’ involvement in Vietnam. This moral imperative argument against the war was especially popular among American college students, who were more likely than the general public to accuse the United States of having imperialistic goals in Vietnam and to criticize the war as “immoral.” Civilian deaths, which were either downplayed or omitted entirely by the Western media, became a subject of protest when photographic evidence of casualties emerged. An infamous photo of General Nguyễn Ngọc Loan holding a pistol to the head of an alleged terrorist during the Tet Offensive also provoked public outcry. Another element of the American opposition to the war was the perception that U.S intervention in Vietnam, which had been argued as acceptable due to the Domino Theory and the threat of Communism, was not legally justifiable. Some Americans believed that the Communist threat was used as a scapegoat to hide imperialistic intentions, while others argued that the American intervention in South Vietnam interfered with the “self-determination” of the country. They felt that the war in Vietnam was a civil war that ought to have determined the fate of the country and, therefore, America was not right to intervene. Media coverage of the war in Vietnam also shook the faith of citizens at home as new media technologies, like television, brought images of wartime conflict to the kitchen table. Newsmen like NBC’s Frank McGee stated that the war was all but lost as a “conclusion to be drawn inescapably from the facts.” For the first time in American history the media was privileged to dispense battlefield footage to public. Graphic footage of casualties on the nightly news eliminated any myth of the glory of war. With no clear sign of victory in Vietnam, the media images of American military casualties helped to stimulate the opposition of the war in Americans. In their book Manufacturing Consent, Noam Chomsky and Edward Herman challenge this traditional view of how the media influenced the war, proposing instead that the media censored the more brutal images of the fighting and the death of millions of innocent people.